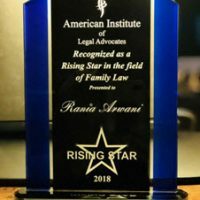 Rania Arwani was recently Recognized as a Rising Star in the field of Family Law by the American Institute of Legal Advocates. This prestigious organization is an impartial third party attorney rating organization that is comprised of 13 various Practice Area Divisions including Family Law. The AILC looks for attorneys that have not only achieved unparalleled success but most importantly have done so for the benefit of their client. Very few attorneys can do so and the organization recognizes this significant achievement. The American Institute of Legal Advocates rating system helps clients throughout the United States make educated decisions when it comes to choosing their attorney. Membership is an exclusive honor and extended to a select number of attorneys in each given state and practice area division.